Dinghy Dock is a classic tourist/transplant dive bar with a great water view and good kitchen. There is also a dude that sells fruit at the fork in the road by the airport. Tree ripened bananas=good breakfast lovin'. Please, don't take a boat with a motor out to see a phosphorescent bay (there's also one in Fajardo.) The gas, oil and exhaust pollutes the water and kills the organisms that glow. If you are physically able, try to with a rowboat or kayak outfitter and fight the urge to swim as your body oils, detergents in your clothing, etc. are lethal to the microorganisms also. If you absolutely cannot row, (*sigh*) go in the motorboat anyway, it is a must see while you're there. If you make it over to Rincon, the restaurant at the Lazy Parrot is not necessarily traditional PR food, but exceptional. I'll second Willie's endorsement of the countryside and Jefe's endorsement of the bacalitos! The art museum in Ponce is a gem. You know, it's been five years, so maybe time for a thread revive! We'll be in PR in January, staying in Luquillo, which is right by El Yunque. Has much changed? Anyone know of food options around there? It's 30 min. from San Juan, I believe. I just got back from my vacation to San Juan, and I have to agree with David...the cuisine was nothing to write home about. In fact, I suspected that the Puerto Rican restaurant on the GNR list might be better than anything I ate in PR (still on my list of places to try). Still, I did my best while I was there. Overall, I had my worst meals in Old San Juan. The restaurants are expensive and cater to tourists, particularly the huge cruise ships that dock near Old San Juan for a day. Most entrees hover around $19. My very first meal in San Juan was the very popular Restaurant Raices in Old San Juan. It's a huge restaurant where the staff dress in native costume and the food is marketed as home cooking. We started with their appetizer sampler, which was an assortment of deep fried things, mostly starches. Most of them tasted the same. For my entree, I ordered their Mofongo, one of their signature dishes. It is mashed plaintain topped with chopped skirt steak. The steak was well seasoned, but the dish overall was very dry due to the plaintains. I didn't bother ordering dessert here. The other meal I had in Old San Juan was La Bombonera, which gets a lot of love in all the travel books. Their plain mallorca from the bakery was great, fresh and soft sweet bread topped with powdered sugar. The rest of their food, however, was a huge disappointment. We ordered the grilled fish fillet, which came out dry, overcooked and tasteless. 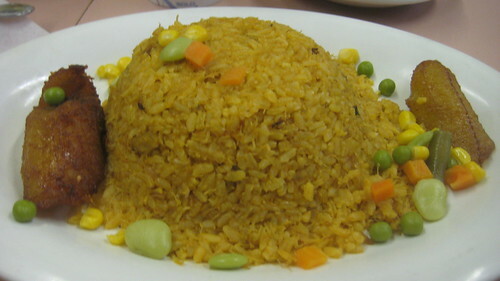 We also ordered the arroz con juyeyes, or rice with crab. I noticed right away that there were little bits of crab shell in my rice. At first I was glad that the crab wasn't from a can, but there were just way too many shells in the rice. In addition, the rice itself was drab, tasteless, and used frozen vegetables. How sad does this rice look? The only place I ate at within San Juan that was passable was Bebo’s Café, a huge diner located in Condado. The menu is a spiral book with tons of American, breakfast, and Puerto Rican fare. 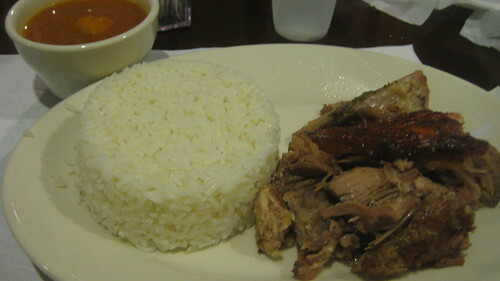 I ordered the pernil asado, or roast pork. The pork is very tender and shreds easily. There is also a piece of roasted crispy skin on top that packs a lot of flavor. This is what I imagine Guavate roast pig to be, without the charcoal pits. At only $8, this was easily the best meal I had in San Juan. The meals we had outside of Old San Juan were much better. The drive we took out to Luquillo Beach was rewarded with kiosk after kiosk of cheap street foods. Lots of options of deep fried fish, plantains, and yucca stuffed with meat. 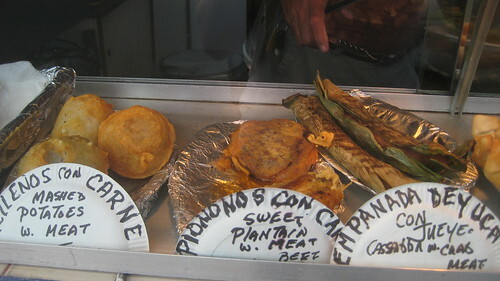 My favorite was the plaintain stuffed with meat and wrapped in a banana leaf. Sweet, salty, gooey, and Carribean. I think it was from kiosk #7. Luquillo Beach is only a little further past El Yunque from San Juan, so it could be coupled in the same day trip. The last culinary destination of note was the indoor fruit and vegetable market at Rio Piedras, about a 30 minute drive south of Condado with all the traffic. There aren’t a lot of fruit and vegetable stands, but there is a food court there with two types of kiosks. One type sells deep fried fare with fresh fruit smoothies. The other serves warm stews. I knew it was the real deal when I had trouble conversing with people in English. The meats at the stew kiosks were pretty overcooked or stewed so long that the stews were mostly bones. However, the flavors of the soup and the rice and beans were better than anywhere in Old San Juan. 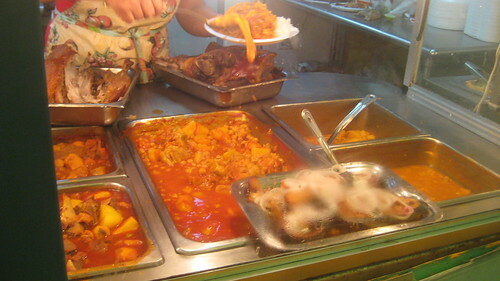 You can get a heaping plate of stew, rice and beans for $7. This is where I felt I was getting the most authentic food, though still not stellar cuisine. I've been meaning to post and thank snap203 for the pointer to Bebo's Cafe. We ate their about a month ago and loved it. It's a large, bustling and fun restaurant. The night were there, it was packed and about three-quarters locals, one-quarter tourists. A large (adult) birthday party gave it a great atmosphere. Very good food, though I don't remember everything we ate. I especially liked the mofungo. Incidentally, on a separate trip my wife ate at Raices and confirms that it is to be avoided. We spent an evening walking around Old San Juan. Caficultura is a nice coffeehouse. We had dinner at Cafe Old San Juan, solid food and friendly service.